When it comes to understanding how to hydrate properly you need to consider two things: how much you’re sweating (i.e. your sweat rate—usually measured in ml per hour); and how much salt you’re losing in that sweat (your sweat concentration. i.e. how salty your sweat is). Understanding both of these gives you an overall appreciation of your net fluid and sodium losses over a given period of time. This enables you to work out a sensible personalized hydration plan. Your sweat rate varies a lot based on the temperature, how hard you’re working and a number of other factors. We’ve seen up to a 5 or 6 fold difference in sweat rates between athletes. Sweat concentration is something fewer athletes have a solid grasp on. It’s all about how much electrolyte (specifically, sodium) you lose in your sweat, and is generally a lot more stable than your sweat rate (it’s actually largely genetically determined). At Precision Hydration, we’ve tested athletes who lose less than 200mg of sodium per litre (32oz) of sweat and we’ve also seen athletes losing well over 2,300mg per liter! Our data suggests the average athlete loses around 950mg/l, which tallies with other large scale studies. But how do you know how much sodium you’re losing in your sweat? Getting your sweat tested is the easiest and most accurate way, but it is possible to estimate your losses and use this to optimize your hydration strategy. In fact, recent research (which we contributed to) found a strong correlation between what how much sodium athletes’ think they lose in their sweat and their actual sweat sodium concentration. You get salty marks on your kit/skin. If you tend to get white, salty stains on your skin or clothing after training sessions or races, you might have saltier than average sweat. Remember that the drier the air, the faster your sweat will evaporate, which often results in more visible salt marks than in more humid conditions. (I see a lot more salt residue on my kit when I go running in Arizona than in Florida, for example). Also bear in mind that salt residue will be more visible on darker kit, so factor that into your observations. Oh, and ignore salt residue found on your kit after a triathlon where the swim was in the sea, for obvious reasons! 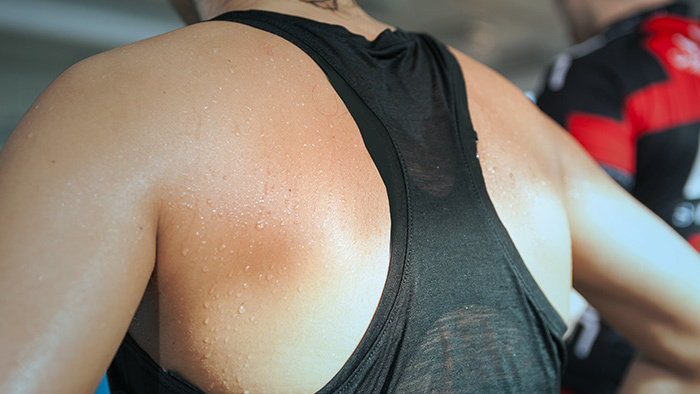 If you have a very high sweat rate, it has to be said that the white marks might be a result of the sheer volume of sweat rather than because you necessarily have very salty sweat. But even if that’s the case, the presence of the salt residue suggests that your net losses might be on the high side and that you might benefit from a higher sodium intake. Your sweat tastes salty and/or stings your eyes (or cuts/grazes). Very salty sweat often stings your eyes and/or creates a burning sensation if it runs into cuts or grazes on your skin. This is why I rarely run without a cap or visor (with a built in sweat band) in the summer! As obvious as it may be (and as gross as it might sound) if you lick your arm when you’ve been sweating a lot and it tastes really salty, this can be another sign that you’re losing a lot of salt. You feel faint or suffer head rushes when standing up quickly after exercise. This is another tell-tale sign that your sodium and fluid losses could be on the high side. When you lose a lot of salt and fluid (through your sweat), your blood volume/pressure drops. This makes it harder for your heart to get enough blood to your brain when you’re standing. Blood pools in your legs and not enough oxygen reaches your brain for a short period of time, causing the head rush or feeling of faintness. The medical term for this is orthostatic hypotension (literally ‘low blood pressure’). This used to happen to me regularly when I was in full time training, especially during the Summer, and losing a lot of sweat and salt can make athletes more susceptible. You suffer from muscle cramps during/after long periods of sweating. There’s a huge amount of anecdotal evidence that high sweat sodium losses can contribute to muscle cramping during and after exercise. If you’re someone who cramps up regularly during/after long endurance events, then this might be a sign that you’re losing a lot of salt (or not replacing what you’re losing effectively enough). You often feel terrible after exercising in the heat. If you often underperform or feel like crap after working out for a long time in hot conditions (and by that I mean more so than those around you, or more than you do after similar exertions in cooler conditions) then your net sodium losses might be on the higher side. You crave salty foods during and after exercise. For us humans, the craving for salt is a deeply hardwired physiological trait. In fact, in terms of basic human drives, it’s up there with thirst when you’re low on body water, the desire to sleep when you’re tired and to get jiggy when choosing a mate. That’s because taking in sodium is crucial if your body is to preserve homeostasis (a balanced state), and in our evolutionary past, salt was not as freely available as it is today. So, we have a deep-rooted craving to replace lost salt when our levels get low. One study demonstrated that fact very neatly. Researchers offered people different soups and recorded which they ate more of when they’d been sweating on an exercise bike. People consistently showed an unconscious preference for saltier soup after they’d been sweating, which the researchers took to back up the idea that our bodies are very good at correcting salt deficiencies through dietary intake when needed. As a logical extension then, if you lose a very large amount of sodium in your sweat when exercising, you’re likely to exhibit a strong preference for salty foods in order to replace your losses. In other words, if you find yourself attracted to the salt shaker when you’ve been training a lot, this might be another sign that your body is trying to make up for a sodium deficit. What can you do if you are a salty sweater? If this article describes your experiences to a tee (at least 5 apply to you) then it’s highly likely that you’re losing a large amount of salt in your sweat (and/or a lot of sweat period!). If that’s the case, trying a more aggressive sodium replacement strategy might be a very good idea indeed. Try upping your sodium intake before, during and after periods of prolonged sweating. You can do this by adding more salt to your food / eating saltier foods or by reaching for an electrolyte supplement or sports drink. Keep in mind that of the most famous supplements don’t contain enough sodium to replace what the average person is losing, let alone the losses of a salty sweater. Look out for the stronger electrolyte drinks containing at least 1,000mg of sodium per litre (32oz). You can also take our free Online Sweat Test to get some initial personalized hydration advice, including recommendations on what level of sodium supplementation might be right for you. You can use this to start a bit of your own trial-and-error testing in training to see whether it helps and refine from there.